We try very hard to provide our clients with fresh food. Handling and storage of fresh food can be a problem. We receive fresh produce through Salvation Farms, a local gleaning operation, the Vermont Foodbank, area retailers and many of our neighbors. 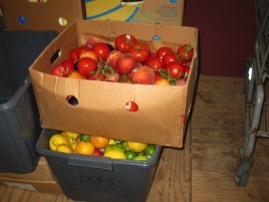 We recently received a grant from the Vermont Foodbank for new shelving and containers for fresh produce. Now our clients can get a good view of what we have to offer. Now that we are averaging over 350 families a month, we wanted to do more. The logistics of handling fresh food for such large numbers of clients were daunting. In 2009, we teamed up with Hannaford market in Morrisville to provide our clients with $2 coupons that could be used to purchase fresh produce. In 2010 we expanded that to include fresh meat as well. We call this our FRESH (Food Resources Everyone Should Have) Coupon Program. 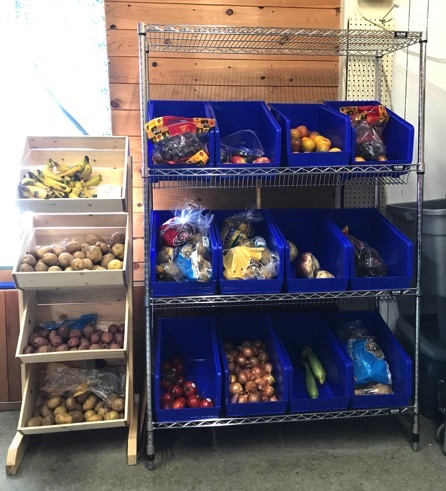 Grants from Hannaford and the Green Mountain Fund of the Vermont Community Foundation plus support from the community at large have helped us to keep this program running. Our clients tell us that the coupons allow them to choose the ingredients to make a healthy meal. In 2012, the Vermont legislature passed Act 148, also known as the Universal Recycling Law. The first part of this law went into effect July 2015. 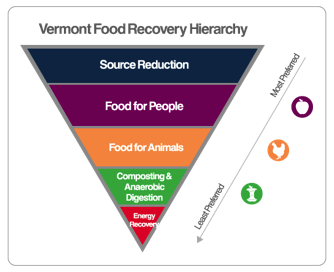 Markets are required to recycle as much of their waste as possible- the first priority being to feed people. 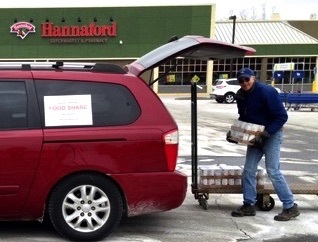 Hannaford in Morrisville has partnered with LCFS to do just that. For many years we have received bread and other bakery productas from both Hannaford and Price Chopper. Now this has expanded to include deli products, produce, meat and dairy from Hannaford. LCFS has purchased a van to help with transportation. We also purchased a new refrigerator for storage. Our most recent purchase is a U-boat to help move this food around the pantry. we are still trying to find the best system for handling this extra food, and the paperwork that goes with it, but our clients are grateful! Every day we receive large volumes of various foods. Although we are very grateful to be able to offer our clients so much more, transporting, storing and distributing this food can be difficult at times.